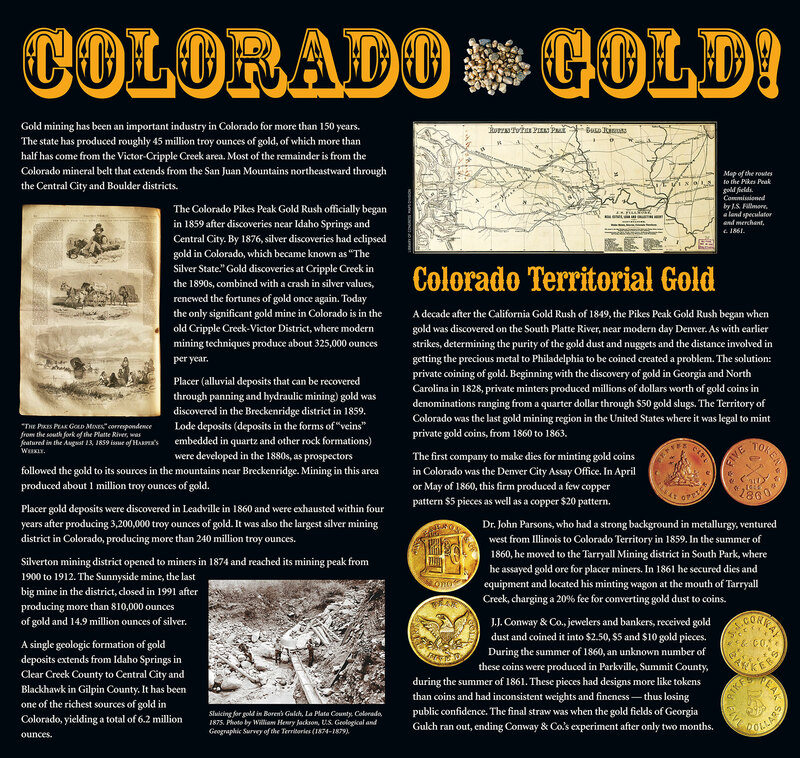 Gold mining has been an important industry in Colorado for more than 150 years. The state has produced roughly 45 million troy ounces of gold, of which more than half has come from the Victor-Cripple Creek area. Most of the remainder is from the Colorado mineral belt that extends from the San Juan Mountains northeastward through the Central City and Boulder districts. 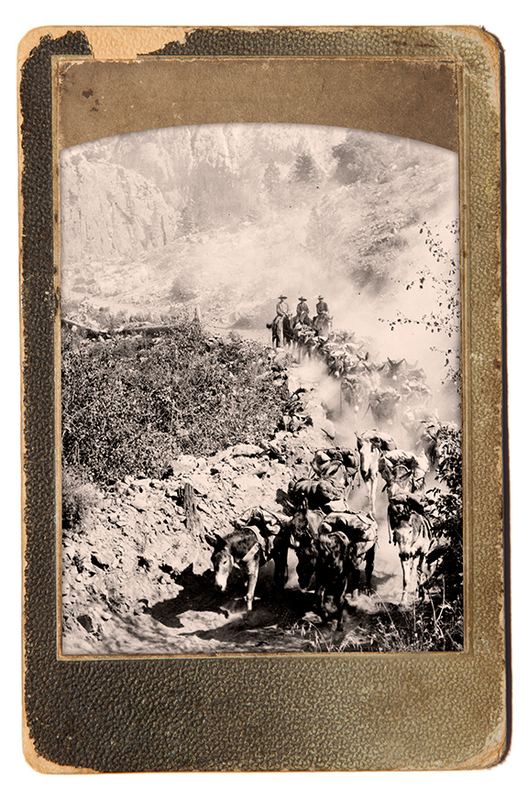 The Colorado “Pikes Peak” Gold Rush officially began in 1859 after discoveries near Idaho Springs and Central City. 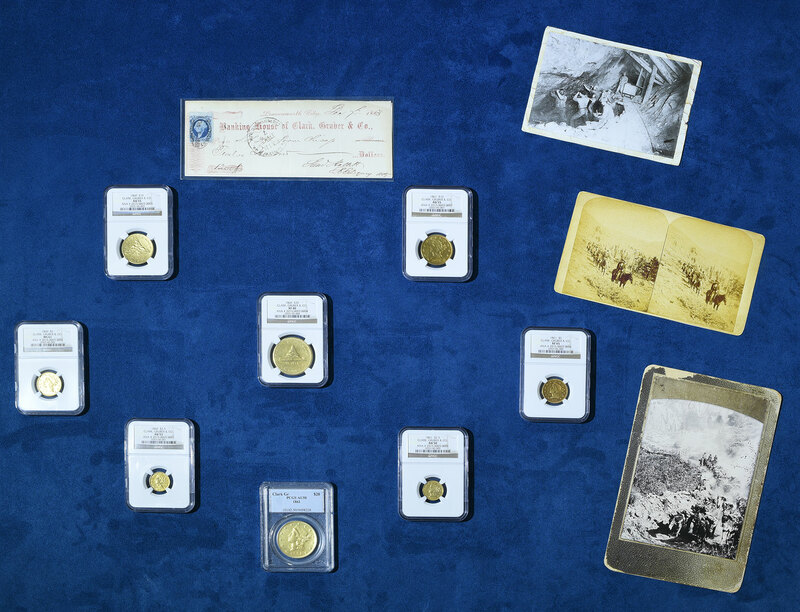 By 1876, silver discoveries had eclipsed gold in Colorado, which became known as the “The Silver State.” Gold discoveries at Cripple Creek in the 1890s combined with a crash in silver values and renewed the fortunes of gold once again. Today the only significant gold mine in Colorado is in the old Cripple Creek-Victor District, where modern mining techniques produce about 325,000 ounces per year. 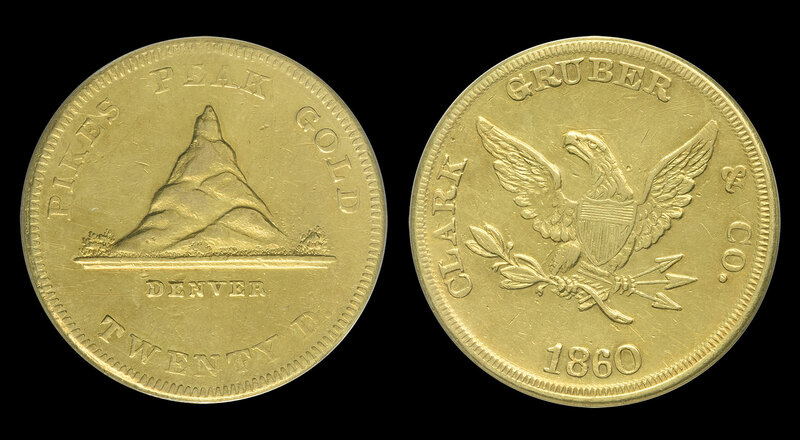 Placer (alluvial deposits that can be recovered through panning and hydraulic mining) gold was discovered in the Breckenridge district in 1859. 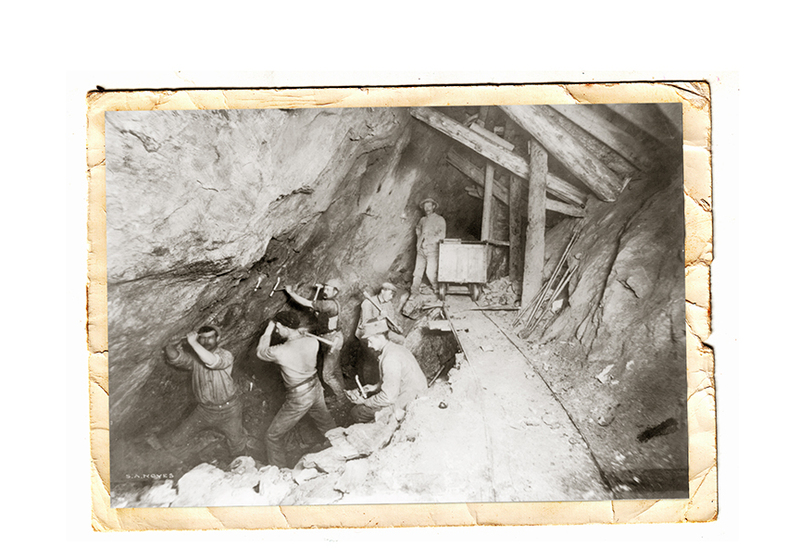 Lode deposits (deposits in the forms of “veins” embedded in quartz and other rock formations) were developed in the 1880s, as prospectors followed the gold to its sources in the mountains near Breckenridge. Mining in this area produced about 1 million troy ounces of gold. 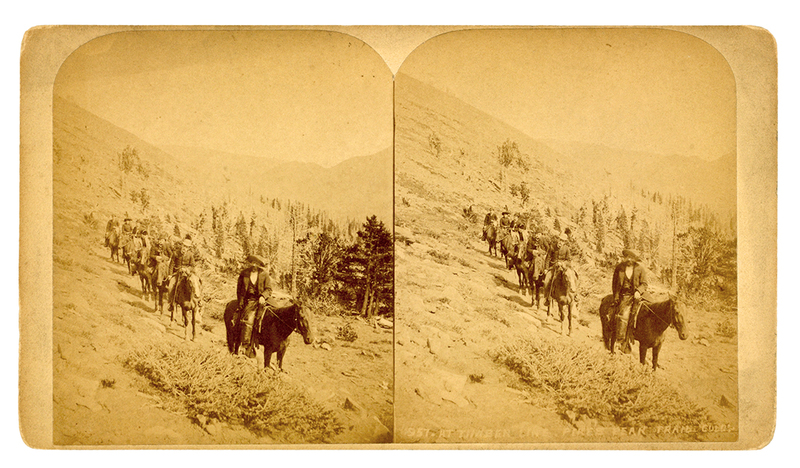 Placer gold deposits were discovered in Leadville in 1860, and were exhausted within four years after producing 3,200,000 troy ounces of gold. It was also the largest silver mining district in Colorado, producing more than 240 million troy ounces! Silverton mining district opened to miners in 1874 and reached its mining peak from 1900 to 1912. The Sunnyside mine, the last big mine in the district, closed in 1991 after producing more than 810,000 ounces of gold and 14.9 million ounces of silver. A single geologic formation of gold deposits extends from Idaho Springs in Clear Creek County to Central City and Blackhawk in Gilpin County. 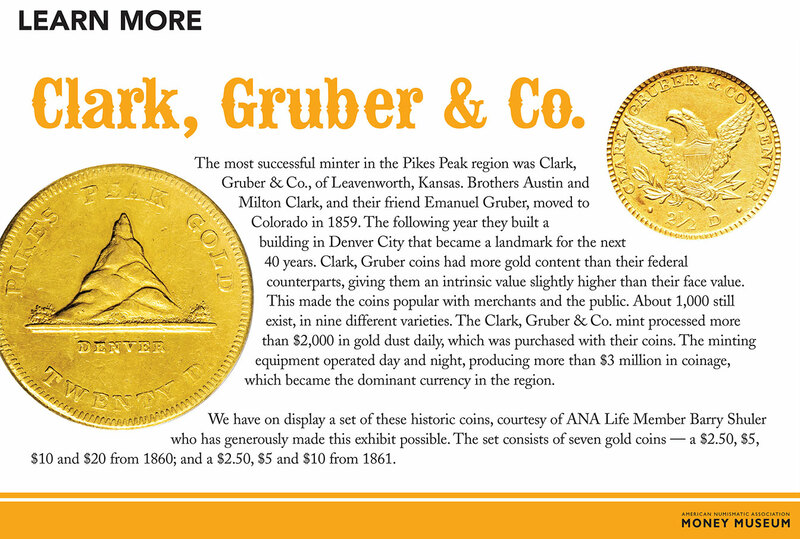 It has been one of the richest sources of gold in Colorado, yielding a total of 6.2 million ounces. 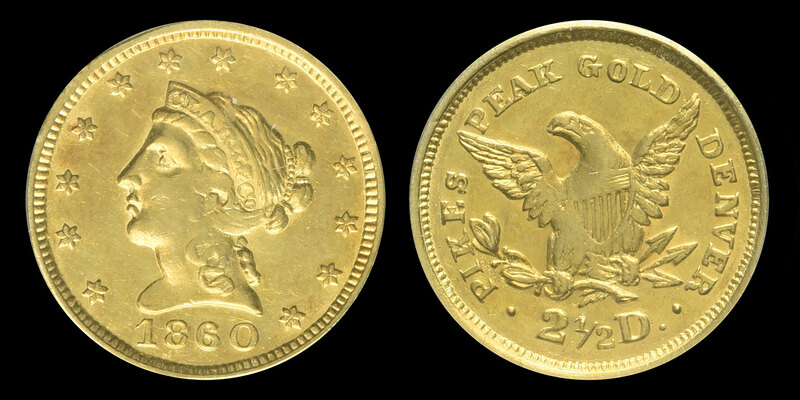 A decade after the California Gold Rush of 1849, the Pikes Peak Gold Rush began when gold was discovered on the South Platte River, near modern day Denver. 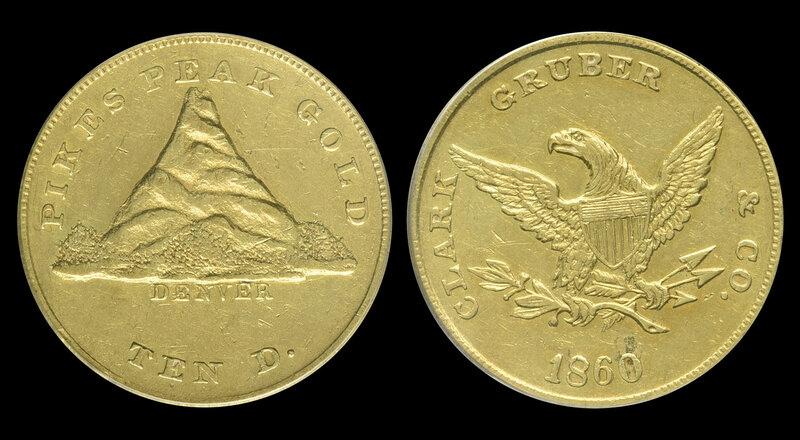 As with earlier strikes, determining the purity of the gold dust and nuggets and the distance involved in getting the precious metal to Philadelphia to be coined, created a problem. The solution: private coining of gold. 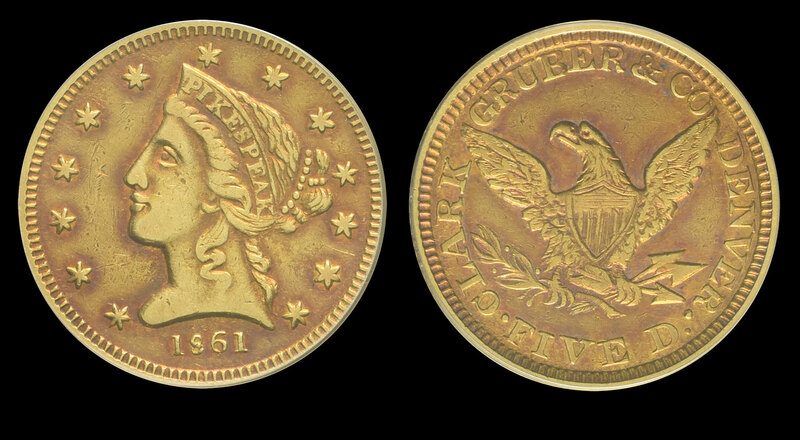 Beginning with the discovery of gold in Georgia and North Carolina in 1828, private minters produced millions of dollars worth of gold coins in denominations ranging from a quarter dollar through $50 gold slugs. 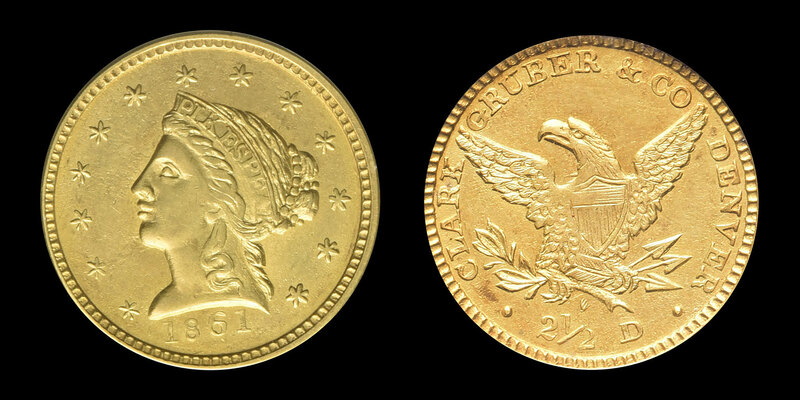 The Territory of Colorado was the last gold mining region in the United States where it was legal to mint private gold coins, from 1860 to 1863. 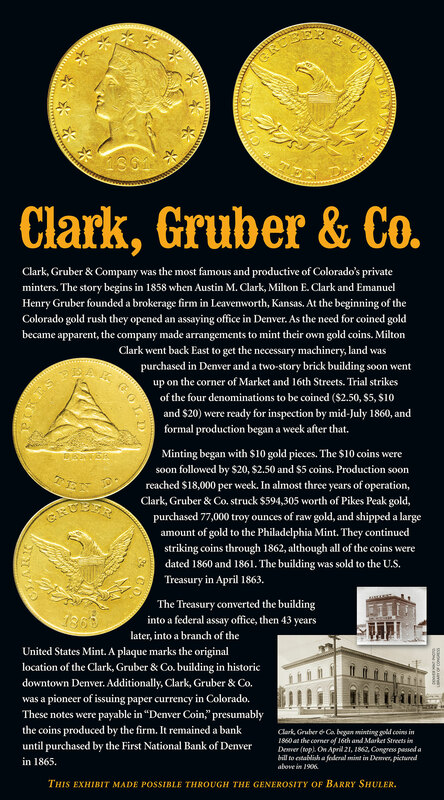 The first company to make dies for minting gold coins in Colorado was the Denver City Assay Office. 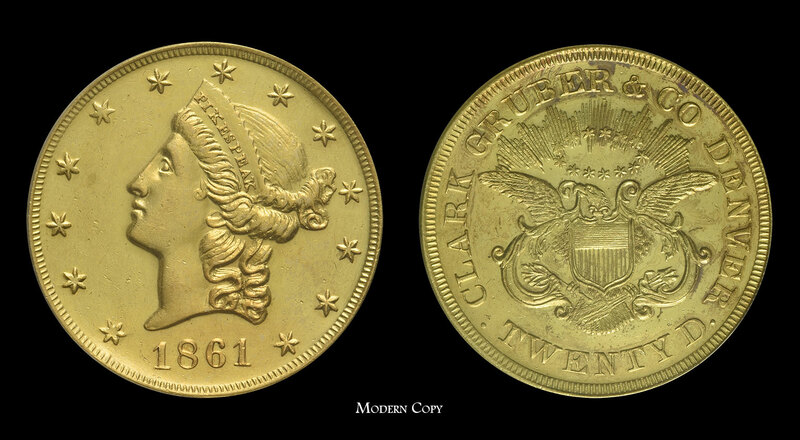 In April or May of 1860, this firm produced a few copper pattern $5 pieces as well as a copper $20 pattern. Dr. John Parsons, who had a strong background in metallurgy, ventured west from Illinois to Colorado Territory in 1859. In the summer of 1860, he moved to the Tarryall Mining district in South Park, where he assayed gold ore for placer miners. 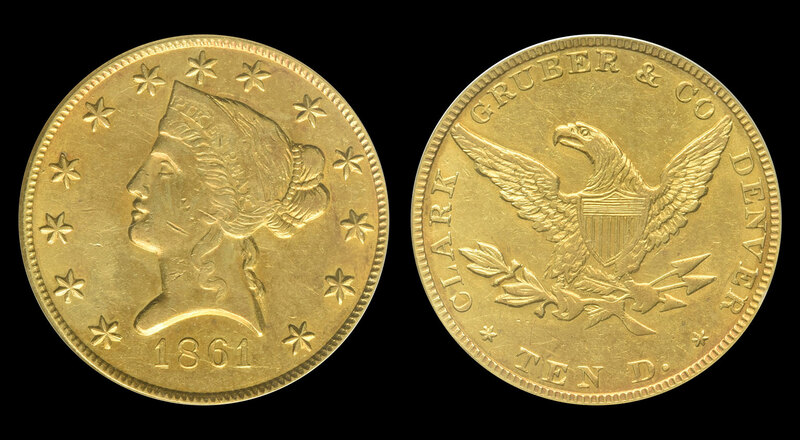 In 1861 he secured dies and equipment and located his minting wagon at the mouth of Tarryall Creek, charging a 20% fee for converting gold dust to coins. 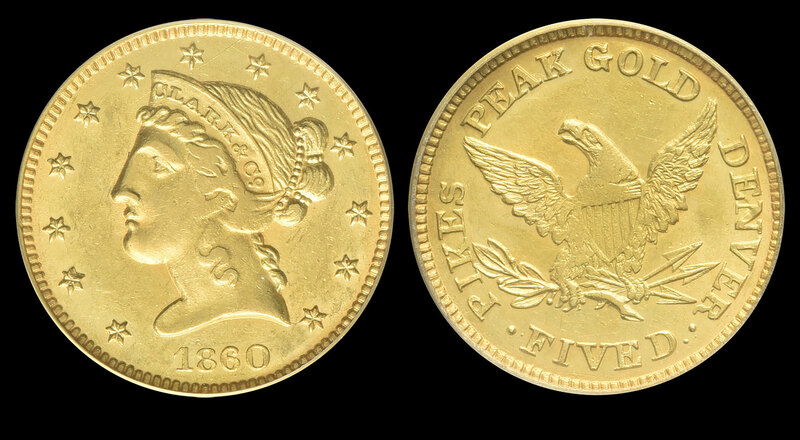 J.J. Conway & Co., jewelers and bankers, received gold dust and coined it into $2.5, $5 and $10 gold pieces. 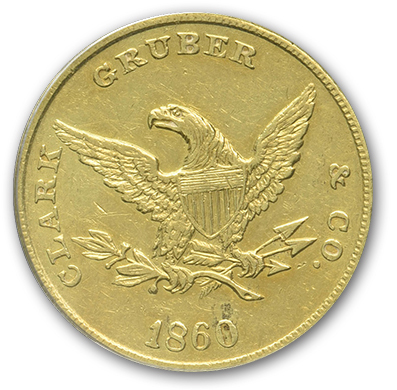 During the summer of 1860, an unknown number of these coins were produced in Parkville, Summit County, during the summer of 1861. These pieces had designs more like tokens than coins and had inconsistent weights and fineness — thus losing public confidence. The final straw was when the gold fields of Georgia Gulch ran out, ending Conway & Co.’s experiment after only two months.